Yes, will take wife and her camera/expertise to MH storage tomorrow and take pic, post. I'm the mechanic. She is the tech Geek. Same as on my 2012. Carry a spare, just in case. Some folks say that you don't want to filter our chlorine because you need the chlorine to keep your water system disinfected. If you don't want the chlorine taste they suggest a filter at the faucet. However if you look at the package, none of the filters take care of impure/contaminated water. If you're talking about a Brita-type filter, then yes. However, if you're talking about under-the-sink Reverse Osmosis (RO) systems, then you are wrong. RO systems are highly effective at removing contaminants from water. May I suggest that if you're concerned about contaminated water, carry a spray bottle with some diluted bleach in it and spray the fresh water hookup at the campground before you connect to it. While this is a good idea, it will not de-contaminate the water coming through the hose. ...May I suggest that if you're concerned about contaminated water, carry a spray bottle with some diluted bleach in it and spray the fresh water hookup at the campground before you connect to it... .
That's what I do. I keep a spray bottle of 1:32 (1/2oz to 16oz water) bleach in the water bay. I spray all connecting point with this on set up and take down, including the CG faucet. This decontaminates the connection points from storage and previous usage, but has no effect on the water running through the lines. ....While this is a good idea, it will not de-contaminate the water coming through the hose. X2 - and assuming the water is safe and contaminant free - you know what else will clean the bib and the hose fittings - flushing them with water. Or what the heck - turn it on, iet cool and wrap your lips around it and take a big drink. Cholorine in water depletes fairly quickly and keeps swimming pool companies in business. Seems a little like worryimg about cats dying in trees to me. Ok - I'm ready for the cholera and Guardia outbreak reports. I gave this belt and suspenders a try this year. May remove the filter from the house filter and go with the external - it has better specs than the stock canister filter. Water enters MH thru hose reel, exits hose reel from right side up to a small manifold I made (from parts I had on hand) that includes pressure guage (with max pressure indicator), into ball valve, then into prefilter, carbon filter and out to MH water system. I removed my check valve and use the ball valve in its place. I don't necessairly recommend anyone else using the ball valve in place of a check valve (doesn't meet NSF code), but it gives full volume flow without the restriction that a check valve causes. You have to be dilligent in turning the ball valve on when hooked to external water and close it when on pump. But I am in the habit now. Just part of my setup procedure. As you can see in this picture, the prefilter canister shows my dirty filter (with a quick glance) that I will change before I hit the road again. 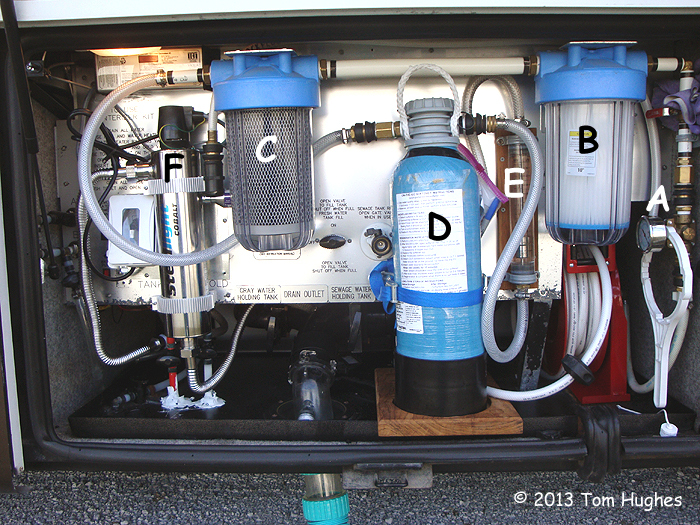 Even tho I acknowledge the argument about prefiltering water thru a carbon filter before storing it in your fresh water tank, I like the idea that every ounce of water that comes into my motorhome is filtered no matter what its' use. I will deal with the potential of stale water in other ways. Hope you get some useful ideas from this. JLDHELMS ... thanks for posting the picture. I think I now understand how it works and really like the set-up. Especially like the fact that you have a pressure gauge on-line at all times and like the double filter approach. May look into converting mine this weekend. One question ... once the water comes out of the 2nd filter ... I assume you have another valve that either 1) sends it into your holding tank or 2) into the coach? JLDHELMS ... thanks for posting the picture. I think I now understand how it works and really like the set-up. Especially like the fact that you have a pressure gauge on-line at all times and like the double filter approach. You can stuff a lot of filters in a small space . . .
Do you often camp where the water is really bad or what? That for sure is a water treatment set-up! Not on purpose, but check my blog for what I found at my current site. I'm curious - doesn't all that filtration, etc impact your water pressure / flow rate, especially where pressure is low to begin with? I considered some of this and have plenty of room, but thought it might be counterproductive after a point. skmwalden, yes. But it is built in and further down the line from the filter outlet. Did not have to change anything about it. It is the valve in the picture you posted, just left of your water filter. Small black handle. This is the second MH I have modified in this way. Last one was an 02 Dutchstar. Has worked well for me on both coaches. skmwalden, yes. But it is built in and further down the line from the filter outlet. Did not have to change anything about it. It is the valve in the picture you posted, just left of your water filter. Small black handle. JLDHELMS ... That's exactly what I was thinking. Really makes this modification much easier. Everything is upstream of that valve (except for the check valve) but I may not change that out. Will take a seriously look at doing this tomorrow. I'm sure if I removed everything, I'd get better flow, but my stuff hasn't noticeably affected shower pressure, etc. BTW, I also use an under-the-sink RO filter for drinking water. Piping between filters is at least 3/4" with 1" PEX between the two filter canisters. These are "jumbos" (10") so there's a lot more surface area than the standard size. The UV sterilizer is just a can with a UV light. Peace of mind is worth a few PSI.